Im a little obsessed with my electric pressure cooker right now. I use the Instant Pot brand, but I know there are lots of others on the market now. 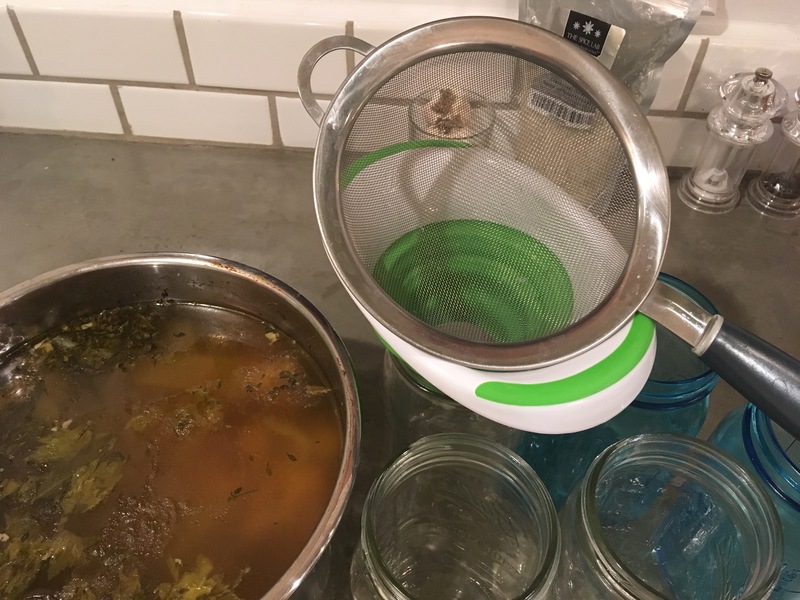 I use it for so many things and bone broth is a big one. I usually make a big batch about once every two weeks and freeze the extra. I use my bone broth to just drink for the benefits Ill list below, but also to make extra nourishing soups. I also make a big batch of brown rice in it (for my non-keto eaters in the house) so I can freeze servings of the rice in flattened freezer bags and then just pull one out for a quick side dish. This makes the rice taste really good and also cooks all of the extra minerals (and protein) into the rice. This is great for sneaking this into your kids meals! Another big thing I use it for is to make my own non-dairy yogurt. The recipe I’ve been using for a while now comes from The Whimsical Wife. Its the first one that I’ve found that makes a nice thick dairy-free yogurt and not some watery mess. I almost always sub cashew nuts instead of almonds though. I like that I don’t have to strain the cashews and this also makes for a thicker and creamier yogurt! I also sub tapioca flour for the corn starch. Then, instead of the crock pot, I now use my instant pot! Works like magic! This is why mom’s homemade chicken noodle soup was always claimed to help cure the common cold! Only back in the day, it was actually made from scratch (and the actual bones) and not from a can! 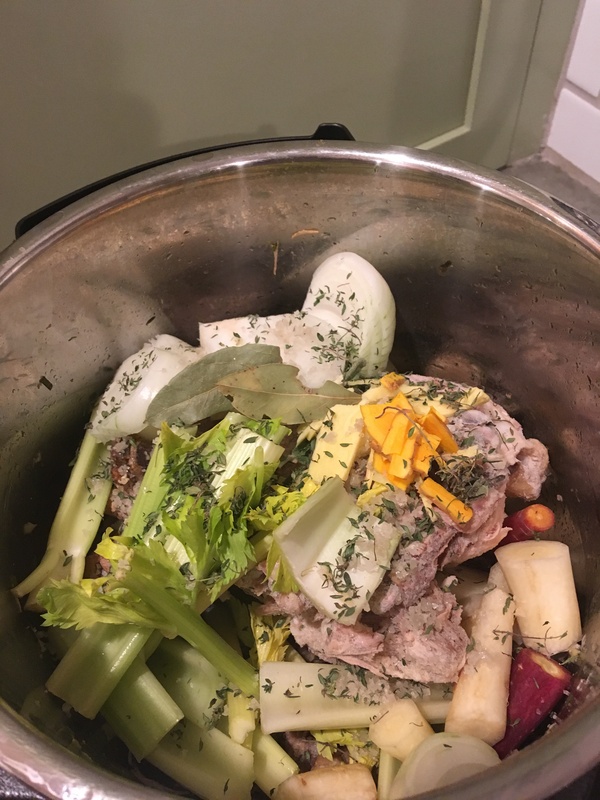 If you want to keep your family healthy this winter, cook with homemade bone broth!In this recipe I use chicken bones that I saved from rotisserie chickens that I purchase most every week. Just save them up in the freezer and when you get about 1/2 – 3/4 a gallon sized bag worth of bones, make a batch. Im going to list a super simple version and then give a list of optional adders that will just enhance your both and make it more rich. These are not necessary to get the health benefits of the broth. 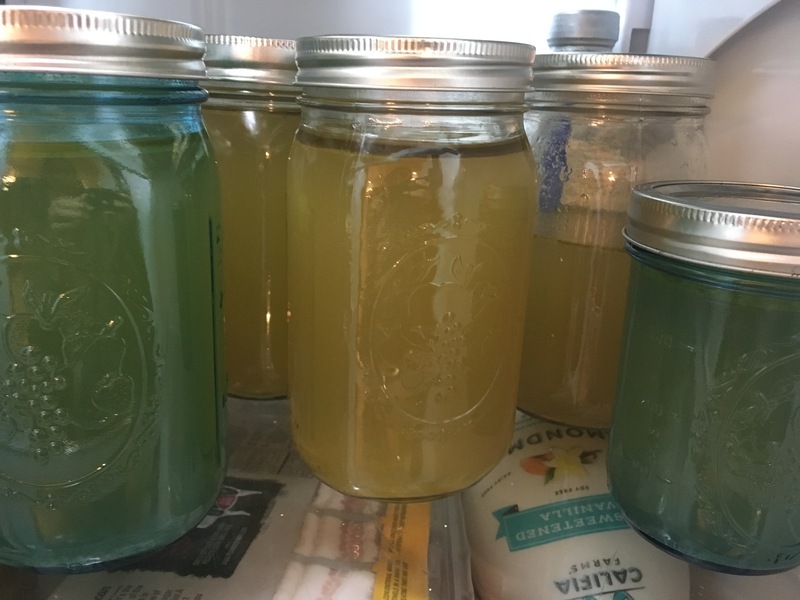 The key is that you want your broth to get a little thick or gelatinous after its been refrigerated. That’s how you know you have a lot of collagen in the broth. But, if your batch doesn’t do this, it doesn’t mean your not getting lots of good stuff from it. It just has less collagen. You can adjust next time by adding a few more bones or cooking 15 mins longer. Throw all of the ingredients under “The Super Simple Version” list above into the Instant Pot. Add optional ingredients as desired. Fill the Pot with filtered water to the “Max” fill line marked on the inside of the pot. Place the inner pot into the Instant Pot housing and close and lock the lid and ensure the vent is closed. Push the “Manual” button and set the time to 90 minutes. Note that I have made this in as little as 45 minutes; it just may not be as gelatinous. If you are time crunched, set it for 45 minutes. Its still worth it! After completion of the cycle, turn the pot off and vent the pressure. Remove the lid and allow to cool a bit. I usually remove the inner pot and set it on the stove so it cools faster. Using a funnel and fine mesh strainer, ladle the broth out of the pot and into 4 cup mason jars (or other containers of choice). Store in fridge immediately for up to a week, or freeze for 6+ months. Hello. 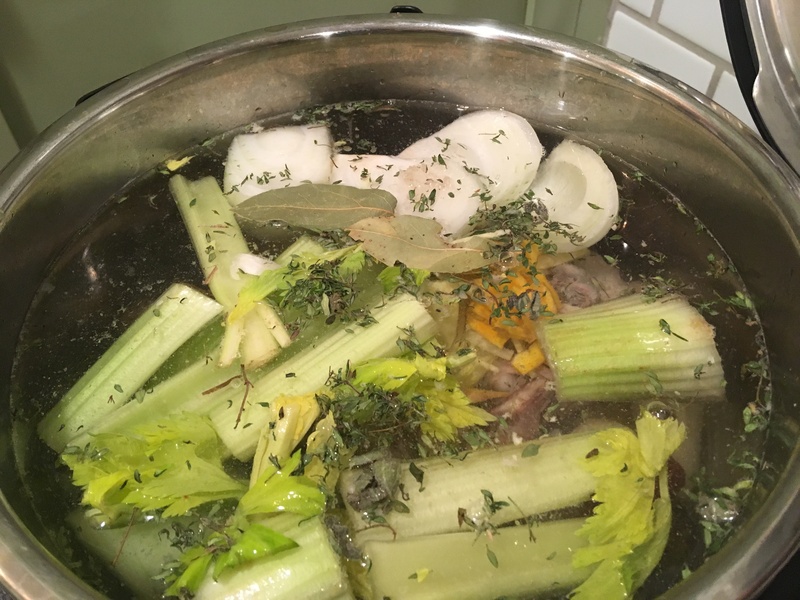 Enjoyed your post as I make bone stock and broths. But I use a crockpot instead. I am hoping that I will get a pressure cooker soon. I wrote down your versions too. Thank you! Prior to getting a pressure cooker I used a crock pot. Same stuff goes in, I would just run the crock on high for 24 hours for a thick and rich stock!